Organ Pipe NM - Photographs-Now, Inc. Organ Pipe National Monument is located in Southwestern Arizona, west of Tucson, at the US-Mexico border. 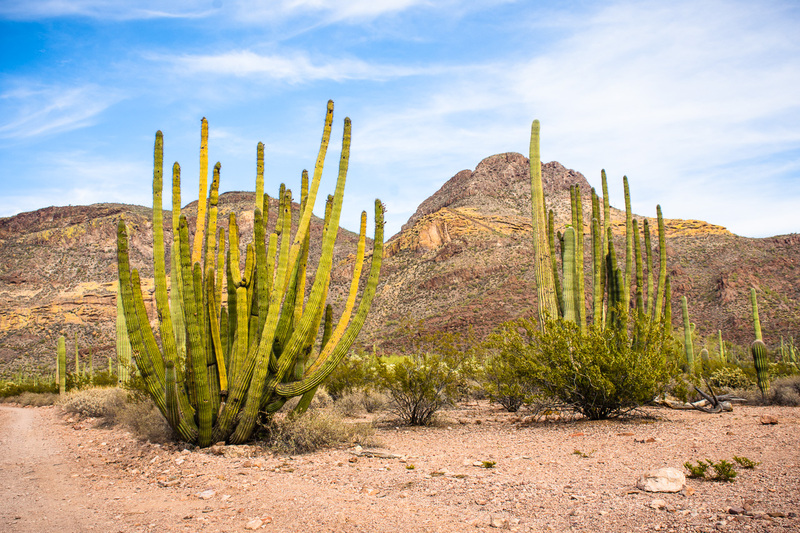 Twenty eight species of cactus live here, including organ pipe and saguaro. The Monument covers over 500 square miles of the Sonoran Desert. These photos were taken in April 2016 along the Ajo Mountain Loop, a 21 mile graded road through the desert. There are magnificent views of the Ajo Mountain range, a variety of cactus species, and two arches high atop Arch Canyon. If you wish to purchase any of the photographs, please select them as you browse by clicking the small "shopping cart." They will automatically appear in the shopping cart and you may purchase the prints when you finish browsing. If you have any comments or suggestions regarding our photographs, please use the Contact section of the website to send us an email.